Reedy Library | Frisco ISD Library Palooza! 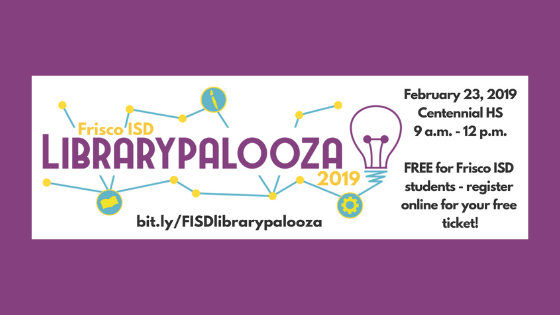 The 1st annual Librarypalooza, a library festival for the Frisco ISD community, will be held Saturday, Feb. 23 from 9 a.m. to 12 p.m. at Centennial High School. This free event for all Frisco ISD pre-k through 12th students and their families is sure to delight pre-readers and readers, alike. While libraries of old are associated with quiet atmospheres and dusty books, Librarypalooza will be festive and fun with talking, laughter and play encouraged with over 60 individual events planned. At the heart of the event are the eight authors and two illustrators who will present about their books, teach writing and drawing workshops and sign books throughout the event. Young readers will have the opportunity to read with trained therapy dogs, participate in a bookwalk and various crafts, get rowdy at the K-3 makerspace playground and read to high schoolers. Older readers will have multiple forums and activities catering to their unique interests including comics, mangas and graphic novels. In the gym, librarians and digital learning coaches will lead students in STEM and makerspace activities including Ozobots, marble mazes, virtual/augmented reality, Stick Bots, Snap Circuits and more! The Perot Museum TECH truck will be on hand to engage youth in hands-on, maker-based STEAM experiences that foster creativity and confidence. Parents will have an opportunity to attend one of the librarian-led sessions with topics ranging from graphic novels to the latest and greatest children’s books. There will also be ongoing programming at FriscoCon (a mini ComiCon) within Librarypalooza. Events include but are not limited to Harry Potter trivia, classic board games, New World Gaming, manga meetup, fanfic writing, miniatures painting and even a fanfic open mic. Chris Barton – Picture book author including bestseller “Shark Vs. Train”, “The Day-Glo Brothers”, and “Whoosh! 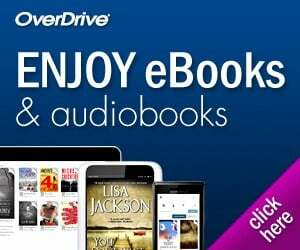 : Lonnie Johnson’s Super-Soaking Stream of Inventions” and many more! Drew Daywalt – New York Times #1 bestselling children’s author whose books include “The Day the Crayons Quit” and “The Legend of Rock Paper Scissors”. Sean Easely – Sean is the author of middle grade and young adult books. His debut middle grade series, “The Hotel Between,” was released in September. AG Ford – New York Times Bestselling Children’s book Illustrator and recipient of two NAACP Image Awards. He has over 30 published books for children and has illustrated picture books for Kareem Abdul-Jabbar, Sharon Robinson, Ilyasah Shabazz, Martin Luther King III, Nick Cannon, Jonah Winter, The Archbishop Desmond Tutu and many others. Mike Merschel – Mike is the author of “Revenge of the Star Survivors”, his debut novel for middle grade readers. Victoria Scott – Author of eight novels including “Titans, Fire & Flood”, “Salt & Stone”, the Dante Walker trilogy, “Hear the Wolves”, and “Violet Grenade”. Christina Soontornvat – Author of the middle grade fantasy novel, “The Changelings”, and the forthcoming picture book, “The Ramble Shamble Children”. Jennifer Ziegler – Author of The Brewster Triplets Series, “Sass & Serendipity”, “Alpha Dog” and “How Not to Be Popular”. When you are not in the presence of a world-famous author or illustrator, there will be a ton of activities for all ages. Guests are encouraged to dress up as a character from a movie, tv show, book or video game with a cosplay/costume fashion show planned at the conclusion of the event. Those interested in competing can sign up here. As a pro-tip, get there on time and be sure to grab a program when you arrive at Librarypalooza to plan out three hours of non-stop fun. You won’t want to miss one moment. Visit the website for the line-up of authors and illustrators and to register for your FREE ticket here.